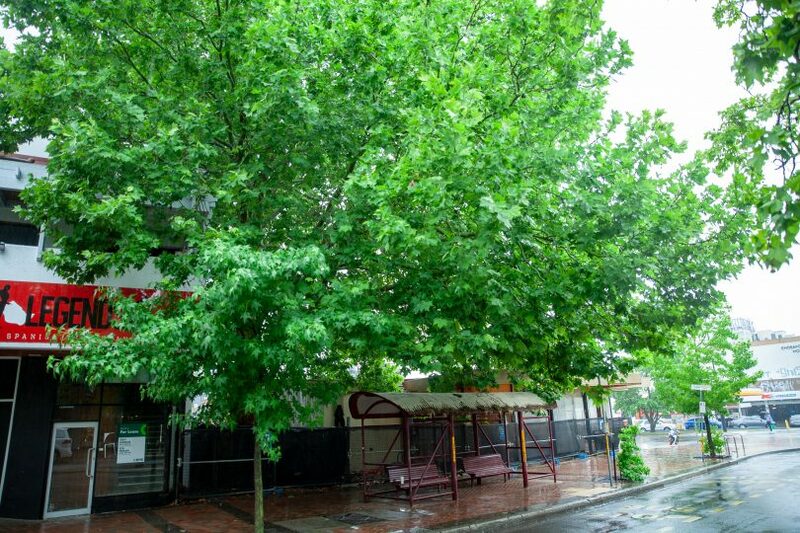 The London plane tree at issue in Manuka. Photo: George Tsotsos. The proposed removal of a registered tree in Manuka will set a precedent that puts every other registered tree in the ACT at risk, according to the Kingston Barton Residents Group. The large London plane tree in question is on Franklin Street on the old post office site and its removal is part of the Liangis family’s proposed hotel development on the prime Section 96 that also contains the Capitol Theatre. The Planning and Land Authority approved the development, subject to certain conditions, on 10 October, including the deregistering of the tree, on the advice of the Conservator of Flora and Fauna, Ian Walker, who is still to make a decision. The KBRG objected to the development not only because of the threat to the tree but over the architectural quality of the proposal, and if it wins final approval the residents’ group will be heading to the ACT Civil and Administrative Tribunal with an appeal. KBRG member Richard Johnston – a planner and architect who retired from ACTPLA in 2006, says the Manuka proposal highlights the way ACTPLA can ignore advice and use technicalities to wave developments through. In March, a key advisory panel, the (Interim) National Capital Design Review Panel – consisting of the ACT Government Architect, the Chief Planner of the NCA, a former head of ACTPLA and of the NCA, and two other senior design experts – recommended the proposal be revised as its current form ‘is not considered to meet key provisions set out in the Manuka Circle Development Control Plan or the aspirations for high-quality architectural response in this prominent location’. It also requested that any revision of the proposal considers retention of the Registered tree, which is to make way for a substation on the site. But this non-binding advice, provided to the KBRG just after public consultation closed on 7 December, was rejected and the DA proceeded. An artist’s impression of the proposed Capitol Hotel. Image: Supplied. The Liangis family had tried several times to have the tree deregistered but a recent legislative change allows anyone to propose that the registration of a tree be cancelled, and on 15 November Mr Walker advised KBRG that another application had been received as part of the DA. This time it came with advice from Chief Planner Ben Ponton that the Conservator may cancel the registration of a tree if, ‘on advice from the ACT Planning and Land Authority, the registration of the tree will significantly compromise the broader strategic planning objectives of the Territory Plan’. “At this stage, I consider that the proposal may satisfy that cancellation criteria,” the Conservator said, as this was precisely the advice from ACTPLA. Mr Ponton told Mr Walker that retaining the tree would compromise the Territory’s ability to deliver a key strategic project for Canberra, and that it would prevent the site being developed, affect the viability of the project and jeopardise the design outcome and quality of a future redevelopment of the site. He also said a site inspection had revealed the tree was causing substantial damage to services and possibly the adjoining Capitol Theatre building. Mr Johnston said this was the first time that a proposal had been dealt with to cancel the registration of a tree, and put every other significant tree in the path of development at risk, despite the importance placed on green-proofing the city against the heat island effect and climate change in the just-released Planning Strategy. He said the site itself was subject to special conditions in the National Capital Plan because of its location on Canberra Avenue and KBRG backed the contention of the Panel that the proposal was not up to scratch. “We just can’t understand why ACTPLA did not really give any obvious weight to the recommendations of that high-level Panel,” he said. Mr Johnston said the decaying state of the site meant some would prefer something happening there rather than the saga drag on. “But in the light of the recommendations of the Design Review Panel we don’t think it’s good enough that ACTPLA just ticks it off and waves it through because most people agree it’s not a particularly high-quality development proposal,” he said. Mr Ponton said in a statement that advice from the Chief Planner of the NCA to the proponent for the development, supporting the location for a proposed substation where the Registered Tree is currently located, was considered. “The NCA advice was provided by the proponent at the time when the DA was lodged. The provisions of the National Capital Plan, associated Development Control Plan and the Territory Plan were also considered,” he said. He said the planning authority strongly regarded the Panel’s advice but it was not a regulatory body or a decision maker for development approvals, nor the cancellation of registration of trees. “It is important to understand the role of the Panel, versus the role of the independent planning and land authority, the latter being responsible for making decisions, having considered all relevant input,” he said. Mr Ponton said that proposed legislative changes, following formal establishment of the Panel, would strengthen its role. An outcry over the removal of one tree. We have become a city (a nation) where almost any proposal is a virtual call to arms for armchair activists, who warn of dark deeds and dire consequences if changes are made. Rarely do these people call for moderation or compromise (offsets in this case, for example). We have allowed ourselves to become a nation of idle whingers, changing nothing, achieving nothing. No-one would advocate planting plane trees today, is that why this one is a heritage jewel? So what are people’s thoughts on removing this tree but then let the developer invest in say an acre of reforestation local to the area in one of our parklands? I’m a huge supporter of trees, but would this be a better environmental outcome? Totally sick of these developers who think they can do as they wish. Save this. Beautiful tree. Why can’t there be some innovative thinking ‘outside the box’ that comes up with a design for a building that incorporates the tree. Why is it that the first things the developers want to do is chop down all the trees. Margaret Dudley, what a wonderful idea. I have seen some pretty cool building designs that incorporated existing trees. It could make an interesting focal point for the hotel breakfast room for example. Of course, all trees do die eventually! Oh the good old' Kingston and Barton Residents Group. A bunch of over 65's, no longer working full-time and hell bent on stopping any progress in Canberra. Yes the tree is lovely, but guess what? There are hundreds, thousands of trees just like it in and around Manuka. The question we should be asking is this development of a high-quality and will it add to the area? Is it better than the run-down, unattractive and unusable space that is there now. In my opinion the building on that site needs to come down and replaced with a well-designed building that complements and adds the area. You’ll be older one day. Maybe then you’ll understand. Gabriel Spacca Yeah but I won't be old, stupid and naive. Anthony Meere 100% correct. Can’t believe how a minority of NIMBYS can hold so much sway. Surely a redevelopment is an improvement on the existing? If the tree has to go, so be it. Where were these people when their residences were being built and trees were knocked down (and used in the construction of) said residences ?? Obviously you haven’t spoken to any business owners about how 1970’s facilities are damaging their business. Let’s just stop pretending there’s any sort of planning in development of Canberra, beyond how much money the Government and other stakeholders can make! Don't fell it! And stand guard from now on, in case of poison attacks. Need a 24 hr tree cam. Keeps the birds, shade, green tones and pleasure where we need it and wheere it's been for decades. Katy Skinner the tree is 45 years old. Hardly historic. Why can’t they transplant it to the arboretum? There are specialised machines to do this and in fact there are lots of other exotic trees in Canberra that could be moved also. The arboretum needs mature tress, not hotels and other kitsch. The people who “run” this territory can’t see the wood for the trees. Jp Romano Manuka does not need another concrete mess as was done to the beautiful Manuka Theatre under Cate Carnell's watch!! Lyn Kemp what year was the original theatre demolished? Lyn Kemp so rather than have a nice modern building, you’d have an; old, semi-abandoned building, which is rife with pigeons and rats? Manuka is dying, but that's ok Lyn, you'll have your precious tree to look at. Anthony Meere Good better than concrete! It”s a nice old shade tree but planted in the wrong spot. Better suited to Telopea Park. Manuka is a town centre (like Erindale and Mawson) and having a huge London plane tree smack dab in the middle of the street is not fit for purpose. It may be a way for residents’ groups to oppose a development but they’re on pretty shaky ground with this one. Also there are plenty of more suitable street trees around that area. Really, it’s no great loss. Please don't let Canberra be another Sydney. A concrete wasteland for the sake of development and progress. Angela Hunter but it was ok to decimate the fields that were there long ago to build a 6 lane road? Right? Ashley Wright no I personally don't think it was but I understand the need to put people somewhere and move them from A to B. I realise we can't stop progress but removing large trees which cool the city and provide shade, is one which many other cities around the world are already regretting. It's important to retain a balance because a treeless city is a disaster waiting to happen. In a storm the trees fell on the road and were a hazard. Problem is they went and planted another stack eucalyptus trees which on 50yrs time will do the same thing. Angela Hunter I know! Now visitors and residents alike have a view to Parliament House from the top of Northbourne, all the way down the road. What a terrible view! Who wants to be reminded of the babies that play in their own nappies up there on the Hill am I right? Simon Dw Disndat eucalypts in a city or urban environment are a stupid idea. They're too prone to breaking. Daniel Königs i have no problem with progress but it just shouldn't be at the expense of greenery. Simon Dw Disndat not necessarily. The issue with the eucalyptus elata on northbourne were that they were watered for the lawn around them. This creates shallow roots. Thankfully the don’t have to water little and often (for a lawn), they can water less often and deeply for trees now in garden beds rather than lawn. Manniferas wouldn’t have been my choice, but I think the design brief was white trunks. Plenty of better, sturdier, non branch dropping eucalyptus, but sadly they weren’t chosen. Angela Hunter they aren’t all prone to breaking actually. So you like greenery... but only if it’s not native to Australia? Janine Baines no... if you remember this post was about a specific tree in danger of being removed to make way for development. Angela Hunter of course not! But in one comment you said that eucalyptus trees were a ‘stupid idea’. Which isn’t true. There are hundreds and hundreds of species... and it is simply untrue to say they are ALL unsuitable for urban areas. They are greenery too, and very important for our native fauna. Janine Baines oh sorry I think you misunderstood me. Often landscapers developing new suburbs will plant eucalypts very very close to houses, footpaths and roads etc. They do have a habit of dropping branches and really aren't suited to urban landscapes... as are many large trees. Angela Hunter bit they don’t all drop branches. Only a few species do. There’s 700+ species. And some make great urban trees. Actually many do. Simon Dw Disndat And half of those are already dead or dying, and those that survive will be a thorn in the side for the trams which won't be able to cope with the litter from the gums on the tracks and overhead wires.